Geetika Jakhar (born 18 August 1985) is an Indian wrestler who has won the silver medal in the freestyle 63 kg category in Doha Asian Games 2006. At a young age she has already won a number of national as well as international events. A student of CRM Jat College and belonging to HAU SAI hostel, Geetika comes from a family of sportspersons. She was born in Hissar. The young wrestler has many achievements to her credit. She won the gold medal in the 63 kg weight category during the Commonwealth championship in Canada last year. Before leaving for Canada, she had won the silver medal in the 22nd senior Asian championship in Delhi. Geetika won the gold medal in the 67 kg category in the junior Asian championship in Kazakhstan in June this year. She was given the title of Bharat Kesari and adjudged the best wrestler, besides being honoured with the prestigious Bhim Award by the Haryana Government. She has also been recommended for the Arjuna Award, the highest national honour in sports. Chandagi Ram (Kaliramna) is One of the best-known wrestlers of 60s and early 70s, who had a huge fan following throughout the country. Tall and well built, he was known as much for his wit and humour as for his reach and tricky holds over his opponents. He earned his name in the Indian style wrestling and his bouts always attracted huge crowds. His bouts against Mehr Din of Rajasthan for the 'Hind Kesari' title used to be packed with drama. With titles like 'Hind Kesari', 'Bharat Kesari', 'Bharat Bhim', 'RusCom-e-Hind' and 'Maha Bharat Kesari', he was the natural choice for the Arjuna Award in 1969 followed by the Padma Shri in 1971. Jyoti Randhawa is one of the pioneers of golf in India. He is presently ranked amongst the top 100 golfers in the world. Born on May 4 in 1972, the ace golf player Jyoti Randhawa hails from New Delhi in Randhwa Clans of Jat Community. His career reached the pinnacle of success, when, consecutively in 1998 and 1999, he became the Hero Honda Master. Jyoti Randhawa started his professional career in golf in the year 1994, after his victory in the All India Amateur Championship in 1993. The illustrious career of Jyoti Randhawa has ranked him the second best Indian golf player, after Jeev Milkha Singh. Randhawa is a regular fame at the Asian PGA Tours and European Tours. His best finish on the European Tour came at the Johnnie Walker Classic in 2004, where he finished second. In 2002, Jyoti Randhawa became the first Asian recipient of The Order of Merit title after his win in the Singapore Open. 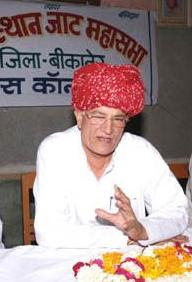 Raja Ram Meel (born 1951) is the president of Rajasthan Jat Mahasabha. He is a leading Industrialist, Social worker and a modern Bhamasah of Jats. He was born at village Nirwana in tehsil Suratgarh of Ganganagar district in Rajasthan in the family of Jat Hindu of Meel gotra. His father’s name is Dana Ram Meel. He is considered to be one of the richest of Jats in Rajasthan. He contributes to every program concerning Jat Samaj. He started with trade in tyre business in Ganganagar. He started taking contracts of wine in 1967. He started Govind Readymade Garments at M.I. Road Jaipur in 1986. He has great contributions to the Jat Mahasabha Sammelan organized on 3 January 1999 and Grand Jats raily in Jaipur on 1 August 1999. Raja Ram Meel is the chief patron of Swami Keshwanand Institute of Technology Management and Gramothan, Jaipur. Besides setting up a Model residential High School at Suratgarh he has contributed in the establishment of about 50 rural educational Institutes.